Only just tweeted but presumably from earlier this week? Well, so much for it being a BSS702. I think this is looking more and more like a technology demonstrator bound for LEO. I wouldn't throw the BSS702 hypothesis away. It could be that the payload of the satellite is NRO-designed, built and operated. Especially because the NRO does not build its own satellites: the contractors build them. I think that's partly true for the payloads as well: the cameras of the KH-4, 7,8, and 9 were built by Kodak or Perkins-Elmer. For comms and SIGINT systems I don't know. As for the operation, we don't know who controls PAN and CLIO. It could be that the NSA has subcontracted their orbital operations to the NRO, since they have the experience. All NRO payloads are " designed, built and operated by @NatReconOfc"
In prelaunch images (see update thread), this rocket's second stage looks slightly different than previous second stages. Some small differences. A cable or conduit duct is no longer visible where it once was, for example. Compare F9-34 with F9-33. Is this more evidence that this is the first block 4 falcon 9? Second stages have been upgraded in tandem with first stages in past revisions. * Second stages have been upgraded in tandem with first stages in past major revisions. The Block upgrades don't align with the Version upgrades, and Version upgrades seem to be the only ones noticeable by us. Most Block upgrades are invisible, unless someone can spot the difference between 1021 and 1031. Just an interesting detail from this pic the 45th Space Wing retweeted. Hazard area from 39A as well as the approach to LZ-1. The Block upgrades don't align with the Version upgrades. Most Block upgrades aren't even noticeable by us, unless someone can spot the difference between 1021 and 1031. There have been the same number of block upgrades as version upgrades, and I haven't seen any evidence showing that they aren't aligned. No camera's allowed on this flight? I haven't seen any evidence showing that they aren't aligned. I... I actually don't know how the blocks line up with the version numbers. Version numbers are pretty much strictly used outside the company and by Elon. Correction. [SES-10] was a block 1 (crs8) and wont fly again. Block 3 boosters could have multiple flights before being retired. Former coworkers of mine that still work there referred to the CRS8 core as a block 1 when we were talking about it last weekend. I had seen this, but without the context of the below quotes took it to mean that they aren't officially aligned, even if they are in practice. This I hadn't seen, as I don't frequent reddit and it didn't show up here that I saw. That's quite definitive, and very interesting. Elon's quip about a "version 2.5" of Falcon 9 makes a lot more sense now. ... because I missed this. I should visit r/SpaceX more. The payload isn't visible from any of those locations, so cameras wouldn't seem to be an issue. The NRO routinely prohibits any footage or telemetry broadcast to public of the majority of upper stage free flights. Therefore, there's no point putting a camera on the upper stage. Interstage is not stage 2. Wouldn't first stage cameras possibly spot the 2nd stage and payload during the flip and boostback? Then again fairing jettison is I think a bit later than stage separation so most likely close video would only be while the bird is still encapsulated. except perhaps missions to GSO, had planar windows. 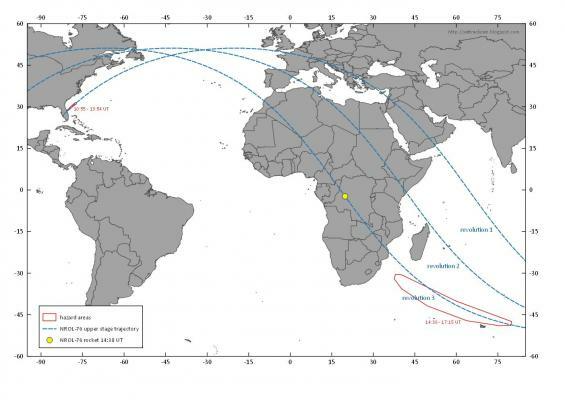 similar location and time range for the de-orbit area. 01h06m-02h07m and 01h52m-02h48m after launch, respectively. second stage to be de-orbited off the coast of Africa. Looking at the hazard area for the re-entry of the second stage, is this a longer stage life than we normally see for other missions. On Dragon resupply missions the stage seems to re-enter just off the coast of Australia which I assume is during the first orbit. Here the hazard area only seems to work on the 3rd orbit.